Curiosity continued her detailed investigation of the interesting suite of outcrops we have been picking our way across during the last week. As we climb up Mount Sharp, recently over slopes of 4-6 degrees, we have seen more varied outcrop structures and chemistries than the rest of the Murray formation, and such changes catch the collective eye of the team. 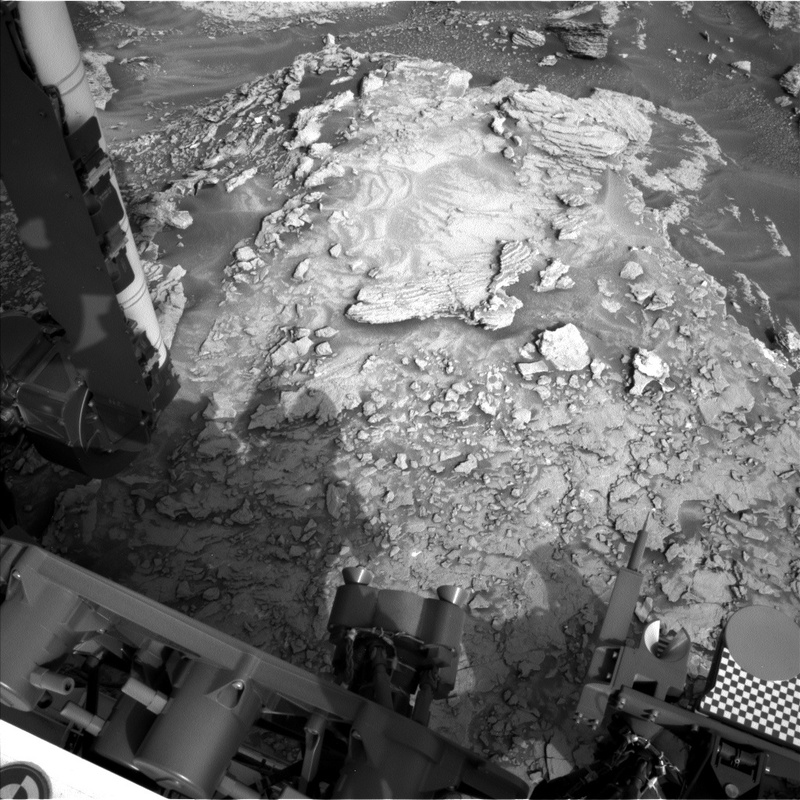 Today's plan will keep Curiosity busy throughout the weekend, investigating some of these unique rocks. One target in the workspace in particular, "Mason Point", will get the royal treatment with five separate science observations directed at it. The reason it will receive such attention is that it will be brushed by the Dust Removal Tool (DRT), removing the thin veneer of obscuring dust that has settled on the rock surface. From the brushed Mason Point target, we will obtain MAHLI images to study the target's texture and grain size, ChemCam and Mastcam spectra of the light reflected off the surface to constrain mineralogy, and an APXS analysis to get chemistry. We will also analyze the chemistry of Mason Point with a ChemCam raster, but before it is brushed. Why? ChemCam's laser not only probes chemistry, it clears dust! The comprehensive and complementary datasets obtained from Mason Point will further our understanding of this target better than any single analysis would alone. Mason Point will get the most focused attention, but the analysis of many other targets will help the science team probe the overall variety of the rocks in this area. MAHLI, APXS and ChemCam will study "Mitchell Hill", a bedrock target exhibiting prominent layering. ChemCam will also shoot "Mount Gilboa" to gather not only chemistry but grain size data for this target. Mastcam mosaics centered on Mitchell Hill and "Manchester Point" will capture orientations of layers in these targets that might help reveal how the layers formed. In a change of pace from looking at rocks, Curiosity invested time in the plan acquiring images with MAHLI that monitor the health and performance of the instrument. MAHLI imaged her calibration target, which contains well known color and geometric targets that offer a test of instrument performance. MAHLI also imaged the APXS calibration target, a slab of finely polished basalt that serves as a chemistry standard for APXS. MAHLI then turned her eye to the sky, purposely acquiring images of featureless parts of the sky. These images, called sky flats, help reveal the presence of dust on the MAHLI lens. Just like dentist appointments, calibration "checkups" occur about every six months. Happily, MAHLI checkups are pain free. After the rover planners drive Curiosity over 50 meters along our strategic drive path, Mastcam and Navcam will obtain a number of images and movies used to measure the amount of dust in the atmosphere, scan the atmosphere for dust devils, and search the sky overhead and near the horizon for clouds. These environmental observations will be complemented by DAN passive and active measurements that seek subsurface hydrogen; RAD measurements that monitor the radiation environment at the surface; and REMS measurements that give us our regular Martian weather reports.